During an applause, Gandhi, sitting with Jyotiraditya Scindia, was seen craning his neck at a party member sitting behind him, while delivering a wink. 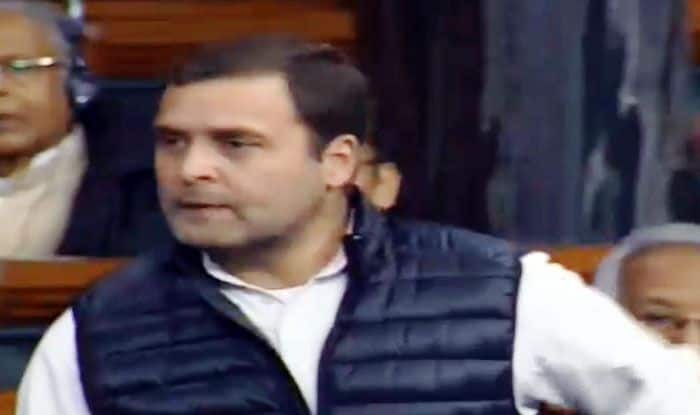 New Delhi: Almost six months into Rahul Gandhi’s winking episode in Parliament, Congress President was spotted doing the same in the Lower House during a heated debate on the Rafale deal on Friday. The incident took place when Deputy Speaker of the house M Thambi Durai, standing in front of Rahul Gandhi, was making his submissions. During an applause, Gandhi, was seen craning his neck at a party member sitting behind him, while delivering a wink. On Friday, during a debate in Lok Sabha, Defence Minister Nirmala Sitharaman dismissed all allegations of corruption in the Rafale fighter jet deal and said it was “far better on every count” on pricing, processes and other factors and hit back at the Congress saying while the Bofors deal was a scam, the Rafale deal would bring Narendra Modi back to power in the coming elections. The reply came on a day when Congress claimed “fresh revelations” that Modi increased the benchmark price from euro 5.2 billion to euro 8.2 billion, which Sitharaman rejected it as false. Getting emotional over Congress President Rahul Gandhi’s attack on her and the Prime Minister, she said he had called them liars.